Forage inventories are generally more than adequate, with good spring carry-overs. With lots of rain, yields were good but it was challenging to make dry hay without rain-damage. Considerable haylage, baleage and poor to good quality hay were made. Premium “horse quality” green, dust-free 1st-cut hay and dairy hay is a bit more limited in supply and selling at higher prices. There are large quantities of much cheaper, poor quality, rained-on, dusty hay available. Export demand for quality hay to the US remains strong. With increased land costs, there is a trend to improve forage management to increase yields and quality in order to make every acre count. An alfalfa disease survey indicates that in addition to these newer diseases, more traditional fungal diseases such as phytophthora, pythium, rhizoctonia, and various fusarium species are very common. With the wet season, there were reports of orchardgrass suffering from fungus disease and some in timothy. Grubs, including June beetles and European chafers, typically cause damage to grass hay fields in lighter soil areas, especially in central Ontario (Oak Ridges Morraine) (“Grub Damage In Hay Fields” http://fieldcropnews.com/?p=2786) Alfalfa snout beetle continues to be reported in small pockets in eastern Ontario. Fortunately it is presently contained to small areas, because it is very damaging and difficult to control. 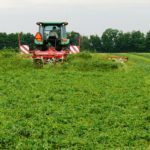 Weather conditions for making quality first-cut hay without rain-damage were challenging in most of June, so considerable amounts of baleage were made. (“Baleage Tips” http://fieldcropnews.com/?p=3531) Others relied on the use of propionic acid in making dry hay. 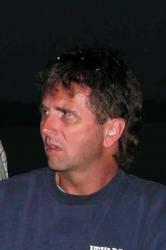 (“Preventing Mouldy Hay Using Propionate Preservatives” http://fieldcropnews.com/?p=3655) Some 1st cut hay was made that was either rain-damaged or became mouldy after baling at moistures that were too high. Second and third-cut yields were variable, depending on rainfall in localized areas, but were typically average or above average. Where fourth-cuts were taken, yield and quality were very good.